Located in Las Vegas, Grandview at Las Vegas is in the suburbs, within a 15-minute drive of T-Mobile Arena and Raider Stadium. This condo is 8.9 mi (14.3 km) from Thomas and Mack Center and 9.7 mi (15.6 km) from University of Nevada-Las Vegas. Make yourself at home in one of the 2156 air-conditioned rooms featuring kitchens with full-sized refrigerators/freezers and ovens. Your room comes with a pillowtop bed. Cable programming and DVD players are provided for your entertainment, while wireless Internet access (surcharge) keeps you connected. Private bathrooms with separate bathtubs and showers feature deep soaking bathtubs and complimentary toiletries. Dip into one of the 5 outdoor swimming pools or 5 spa tubs and enjoy other recreational amenities, which include a fitness center. Additional amenities at this condo include wireless Internet access (surcharge), an arcade/game room, and gift shops/newsstands. Grab a bite from the snack bar/deli serving guests of Grandview at Las Vegas. 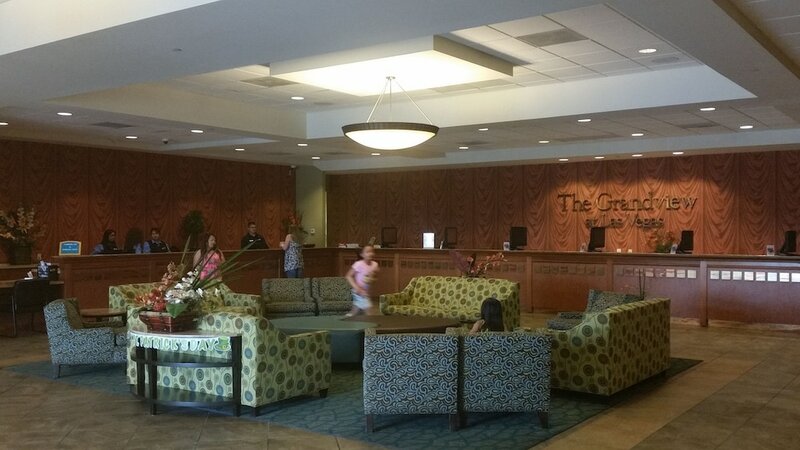 Featured amenities include a computer station, a 24-hour front desk, and laundry facilities. The Grandview at Las Vegas comprises 5 12-story towers and 3 20-story towers. The property is set across from the South Point Casino, 7 miles (11.2 kilometers) from the south end of the Las Vegas Strip. On-site amenities include 5 outdoor pools, one with a waterfall, 5 spa tubs, a children's pool and play area, a video arcade, and fitness center. High-speed Internet access via 9 computers included in resort fee is available in the Owner's Lounge and throughout public areas. Scotty Bean's - Cafe and convenience store offering sandwiches, pizza, and sundries. Open daily. There are several dining options within the surrounding area, including at the hotel/casino across the street. In addition to captivating casino action, Las Vegas offers a wealth of entertainment opportunities designed to dazzle you and yours. Enjoy the sights of Las Vegas from the observation deck 50 stories above the Strip on the replica Eiffel Tower at Paris. Catch Cirque du Soleil. You can also hike in scenic Red Rock Canyon, take a riverboat cruise on Lake Mead and learn about the inner workings of the Hoover Dam! A large sundeck surrounds the 4 outdoor seasonal pools, one with a rock waterfall. Guests can relax in any of 5 hot tubs. The fitness room contains treadmills, elliptical machines, exercise bikes, resistance equipment, and free weights. An arcade room, billiard area, and onsite miniature golf offer fun for all ages. A 64-lane bowling alley is at the hotel/casino across the street. Red Rock Canyon National Conservation Area, with rock climbing, biking and hiking trails, and scenic drives, is about 12 miles (19.3 kilometers) from the hotel. Mount Charleston, about 40 miles (64.4 kilometers) away, has biking and hiking trails, horseback riding, skiing, and snowboarding. Tennis courts, bowling centers, amusement centers and arcades, roller and ice-skating rinks, batting cages, and more can be found within city limits. About 20 golf courses are within 15 miles (24 kilometers), including Desert Pines, Royal Links, Las Vegas National, Desert Inn, and Badlands. Rollaway/extra beds are available for USD 25.0 per stay. Cribs (infant beds) are available for USD 10.0 per stay.